Spring is here and the weather is fine so start planting! I used this adorable image from Pollycraft. Isn't she cute! Oh, Oh, Oh!! Dawn this is so super cute. Love that image and how you have placed her on that little notebook background. The stamped stars at the top of the card are also awesome! 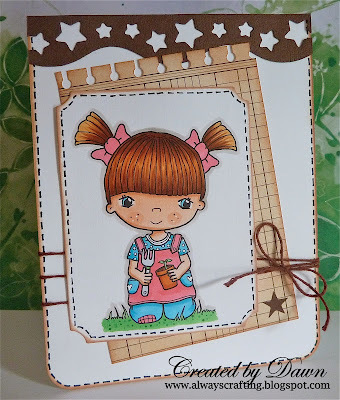 Really cute image, and fabulous notebook paper and stars! Aaaah, this is adorable. Love the string bow which finishes it off beautifully. Aww Dawn this is so super sweet! Gorgeous layout and colours and colouring! Thanks so much for joining us for the MMmmmm Choklit challenge at Pollycraft this week!